The biochemistry of food is the foundation on which the research and development advances in food biotechnology are built. In Food Biochemistry and Food Processing, lead editor Y.H. Hui has assembled over fifty acclaimed academicians and industry professionals to create this indispensable reference and text on food biochemistry and the ever-increasing development in the biotechnology of food processing. While biochemistry may be covered in a chapter or two in standard reference books on the chemistry, enzymes, or fermentation of food, and may be addressed in greater depth by commodity-specific texts (e.g., the biotechnology of meat, seafood, or cereal), books on the general coverage of food biochemistry are not so common. Food Biochemistry and Food Processing effectively fills this void. Beginning with sections on the essential principles of food biochemistry, enzymology and food processing, the book then takes the reader on commodity-by-commodity discussions of biochemistry of raw materials and product processing. Later sections address the biochemistry and processing aspects of food fermentation, microbiology, and food safety. 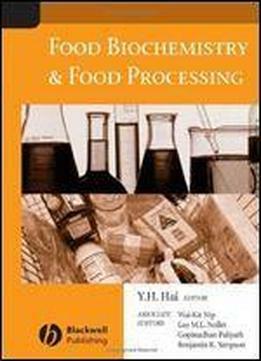 As an invaluable reference tool or as a state-of-the-industry text, Food Biochemistry and Food Processing fully develops and explains the biochemical aspects of food processing for scientist and student alike.